Hyde 10yo (46.0%): Gosh, it's been forever since I posted my last review... In two months I traveled to Prague and Istanbul, toured to Great Barrington and moved to Los Angeles..! Yes, tire-bouchon's new home is in West Hollywood, Los Angeles and my first review from West Coast is a ten year old single malt from Ireland. 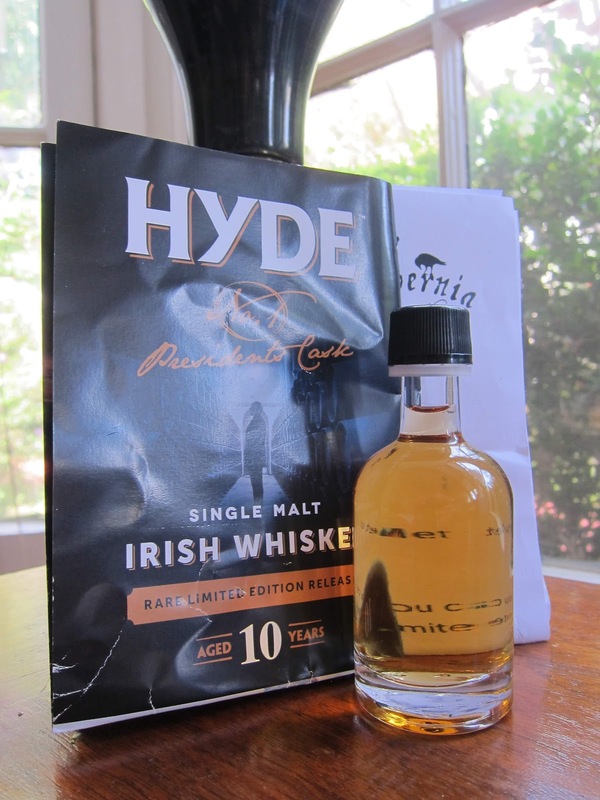 Hyde is a brand owned by Hibernia Distillers named after Douglas Hyde, the very first president of Ireland. They are located in West Cork and are the new boys in the lightning fast growing Irish whiskey industry. While they are planning to distill their own spirit within five years they source their whiskey from other distilleries for now. This single malt in my sample bottle is coming from Cooley Distillery owned by Beam Suntory located in County Louth. It is aged in first fill bourbon casks and then finished in toasted Oloroso sherry casks about six months. 5,000 bottles are released worldwide. Color: Medium amber, copper tubing. Nose: First it noses younger and higher proof than it is. After airing it a few seconds I start to get a large summery fruit bowl nose topped with light honey and whipped cream. Quiet nice: White peaches, apricots, baby bananas and oranges. Peach Melba... Orange blossom honey, American diner style banana cream pie and lemon zest cookies. With a few drops of water tons of malt, honeysuckle and dry hay notes surface. Palate: More grassy and spicy and less fruity than the nose suggested: Cinnamon, rock candies and spearmint. Water rounds the spicy edges very nicely. Toasted oak, white pepper and nutmeg. Finish: Medium - long with sizzling red and black peppercorns. Actually lasted way longer than I expected. I am still getting some lingering spices at the back of my tongue. Overall: Well, definitely not your usual Irish whiskey. It has a great distinct character and I am sure a lot of people will describe it as "like a Scotch" and it is damn true but I don't think that it is fair to the Irish Whiskey community. I will feel better to say that it tastes like a single malt whisk(e)y as I expected it to be and it is a good one. Actually this is the second single malt whiskey I sampled from Cooley Distillery within a week (other one from an independent bottler) and they both tasted great... I think Single Malt Irish Whiskey is about to be a better known category by itself pretty soon. Thanks to Hibernia Distillers for the official sample.